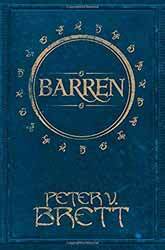 Peter V. Brett, known for the critically and commercially successful The Demon Cycle, continues to publish novellas which expands on the back stories of some of the central characters. Barren (2018. 120 pages) follows the story of Selia, Speaker of Tibbet’s Brook, a small hamlet, away from the main action of the cycle, but still beset with the nightly visitations from demons. The Brook does not have the same levels of wards as other towns, but still they find a way of fighting back. In their battles many of the elders have tasted of the demons, gaining back youth and vigour. For Selia Square, known also as Barren, it has awakened feelings she thought long dormant. In a predominantly misogynistic world Selia’s sexuality becomes an on-going contention in her life. Within the culture of a small town is not a place one would wish to be different, but Selia loves who she loves and fiercely defends her right to do so. The story is split into two time frames. In the present a nest has appeared outside of the town, threatening all who live there. Their defence, led by Selia is brought under question, partly for past conflicts, stemming from her sexuality, but also because her re-found youth has reawakened her desire for love. In the past we follow Selia battling against the prejudice of the town, though her own family are supportive. Brett, obviously, means to show a woman who will fight for what she believes is honest and real, but the cost of her moral standing ends up not only with the loss of love, but also the loss of lovers. The books slots in nicely with the mains cycle but be warned that its references to the wider world do hold spoilers. Likewise, there is little world building in the novella, at only 120 pages much of the needed backstory of what is happening occurs in the main cycle. For fans of the series this is another nice return to the world, but I think that new readers should start with the excellent main cycle.